1946: U.S. Atomic Energy Commission is created. The commission offers contracts at generous prices to spur development of a domestic uranium industry. 1954: Brothers Jim and John LeBret discover uranium on the Spokane Reservation. They and their partners form Midnite Mines Inc.
1955: Newmont Mining Corp. joins with Midnite Mines to develop the deposit. Dawn Mining Co. is formed. Ownership is 51 percent Newmont and 49 percent Midnite Mines. 1955 to 1965: Dawn Mining Co. sells uranium to the Atomic Energy Commission, the only buyer at the time. 1958 to 1965: Dawn provides an average of $1 million a year in dividends to Newmont. 1969: After a four-year shut down, Midnite Mine reopens to sell uranium for nuclear power production. 1981: Operations cease at the Midnite Mine. 1988: One of the mine’s open pits has hundreds of millions of gallons of contaminated water. Federal government raises concerns about water overtopping the pit. 1991: Dawn ordered to operate a water treatment plant to prevent Pit No. 3 from overflowing. 1997: Federal government starts negotiations with Dawn and Newmont for study and cleanup of the site in compliance with environmental laws. 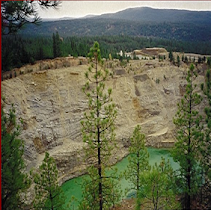 1999: Spokane Tribe sues to prevent storage of radioactive wastes from other sites at the Midnite Mine. 1999: Midnite Mine proposed for Superfund listing. 2005: Federal government sues Newmont and Dawn for cleanup costs at the site. 2008: U.S. District Judge Justin Quackenbush rules that the U.S. government, Dawn and Newmont are each responsible for one-third of the Midnite Mine’s cleanup costs. Many members of the Spokane Tribe heed the ATSDR warnings and do not dig roots, like this bitterroot, in the Blue Creek drainage. Instead they collect traditional foods in other locations including public and private land outside of the reservation. “We used to go to rockypoint (a root digging spot located between Midnite and Sherwood mines) but we have stopped doing all gatherings around Blue Creek,” said Deb Abrahamson. White camas, known by the scientific name of Lomatium canbyi, is a member of the parsley family. Sometimes known as biscuit root or desert parsley, it’s different from brown camas, a blue- flowering plant that’s a member of the lily family. After a prayer evoking “the Grandfather’s” blessing, four generations of the Spokane Tribe set off across a sagebrush-dotted pasture in search of white camas roots. Elders wore woven baskets strapped to their sides. Teenagers moved in packs. Parents accompanied elementary school-age students who were out of school for the occasion. “Found one! Found one!” crowed 7-year-old Gunner White, dancing with excitement near a short stalk with brown seed heads. His older sister handed him the root digger, a long metal spike with a curved end. Gunner dug up a root the size of a small radish. It was crisp, like a turnip, with an aftertaste faintly reminiscent of solvents. “Some people compare it to the smell of kerosene,” said Pat Moses, a tribal elder who attended the community root dig. White camas roots are peeled, strung in chains and air-dried for winter consumption. The starchy roots are one of the traditional foods eaten by the Spokane Tribe. Each May, community members gather for the annual root dig. It’s one example of why cleanup of uranium waste is so important on the Spokane Reservation, said Deb Abrahamson, executive director of the SHAWL Society, an environmental activist group there. Gathering foods eaten by their ancestors is important to tribal members, she said. Yet eating native plants, wild game and fish can expose people to heavy metals and radiation. The annual root dig takes place on U.S. Bureau of Land Management grazing land near Harrington, Wash. Areas around the defunct Midnite uranium mine are no longer used for harvesting food. Abrahamson’s family has stopped gathering chokecherries in the Blue Creek drainage, which is downstream from the mine. It isn’t safe to eat plants from the drainage, according to a 2009 public health assessment by the Agency for Toxic Substances and Disease Registry. The study cited polluted ground and surface water, which carries heavy metals and radioactive materials from the mine into the Blue Creek drainage. The creek flows for 3 1/2 miles before emptying into the Spokane River. 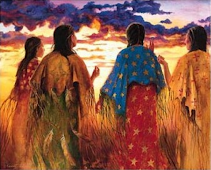 As a result of the warning, other members of the tribe no longer gather herbs for medicinal teas along Blue Creek. Eating fish from the creek isn’t safe either. Consuming meat from deer or elk that graze in the drainage may pose health risks as well, said the study, which recommended further testing of the meat. Marsha Wynecoop has organized the annual community root gathering for 18 years. The harvest of white camas marks the beginning of gathering season, which includes dozens of edible wild plants. The tribe’s members have an intricate relationship with the land, said Randy Abrahamson, a former uranium worker who’s a distant cousin of Deb Abrahamson. Preserving tribal culture includes preserving the ability to harvest traditional foods.